Terry R. Kutz portrays Ben Franklin. 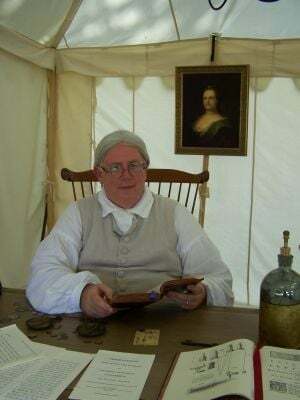 Terry R. Kutz never knew that his first portrayal as Benjamin Franklin would lead to a new passion. He became interested in re-enacting via his family genealogy and one day agreed to help out at a historical event by portraying Franklin. The next day everyone wondered why he wasn’t dressed as the Founding Father. “This is a hobby my wife calls an obsession,” says the 60-year-old of New Berlin. An obsession like no other anyway. Donning his long frock coat, wig and wire spectacles, Kutz turns into the prolific writer, inventor, Declaration signer, printer, philosopher, and 18th century Renaissance man of many other titles. More specifically, portraying Ben has become almost like another job to Kutz, who enjoys being Ben at historical events whenever he can. Kutz has done considerable research, reading everything he could about and by Franklin so he can tell the listener most anything about his alter ego, even a few things that are not well known. He can tell you how the kite experiment worked, about Franklin’s electricity in a bottle, and his role as the first postmaster. He’s even gone so far as to print replicas of the first pieces of money Franklin printed for the colonies. Ask him most anything and Kutz is a walking encyclopedia, slipping so easily between personas that sometimes it’s hard to tell who’s talking. Of course, all this takes some investment on his part, and doesn’t come cheaply. “This costs money,” he says. Yes, he still works full-time as a financial planner. But to be authentic, he continues to add antique and unusual items to his collection that would have been part of Ben’s life — a 1700s era wood writing desk, old glass bottles, and recently a replica portrait of Franklin’s wife, Deborah Read, who died in 1774. Oh, and he’s having a fashionable new suit made in Franklin’s often worn shade of gray. The custom-made linen suit with hand-sewn elements will cost about $1,000, what Kutz considers a small price to pay to portray such greatness.